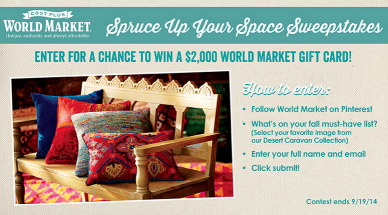 World Market Spruce Up Your Space Pinterest Sweepstakes – Win a $2,000 World Market gift card! Win a $2,000 World Market gift card! You will need to re-pin any pins from WM’s “Spruce Up Your Space Pinterest Sweepstakes” board Pinterest (chose from the photos on the entry form). ENTRY LIMIT – Limit one (1) Entry per person, per Pinterest account and per email address for the duration of the Sweepstakes Period. ELIGIBILITY – World Market’s Spruce Up Your Space Pinterest Sweepstakes is open to legal residents of the fifty (50) United States and District of Columbia (excluding Puerto Rico and all other United States territories and possessions) who are 18 years of age or older at the time of entry. SWEEPSTAKES PERIOD – Sweepstakes begins at 12:01 a.m. Eastern Time (“ET”) on 9/5/14 and ends at 11:59 p.m. ET on 9/19/14. PRIZES – GRAND PRIZE: $2,000 World Market Gift Card. ARV $2,000.